I actually bought the materials for this project a few months ago and never followed through. Sand play has been a daily occurrence in our house lately, so I thought this would be a great time to make the sand rollers. It all started when we brought in the FUNNEL RACK for some indoor sand play. That play led to us creating a HOURGLASS, and then my son spent a lot of time pouring sand into bottles and onto the tray where he drew pictures and used the bottles to imprint shapes. Our first (extra large) hourglass broke. I found these smaller jars at Michaels for 99 cents and we used gorilla glue to adhere them. 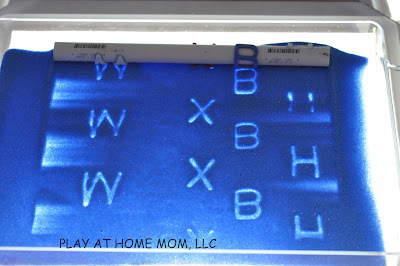 For the DIY sand rollers I used PVC piping and alphabet foam stickers (found at Michaels). There are so many options - animal stickers, numbers, shapes, etc etc. I used one for upper case, one for lower case, and one to spell out his name. We used the sand rollers with blue sand (from Michaels) in an acrylic tray on the light panel. I'd love to know where you got your tray. I'm looking for something large, clear, and attractive for messy stuff on my light box. Thans a lot for sharing! I'll do it immediately!! What is the light box and where do you get that? This is a fantastic idea! I wonder if the foam letters would be sturdy enough to print on play dough? I'm going to try it. lol. I'm a prek teacher and I'm working with the kiddos on spelling their names. This would be a great activity to help them!